There's something so satisfying about a well made sandwich. 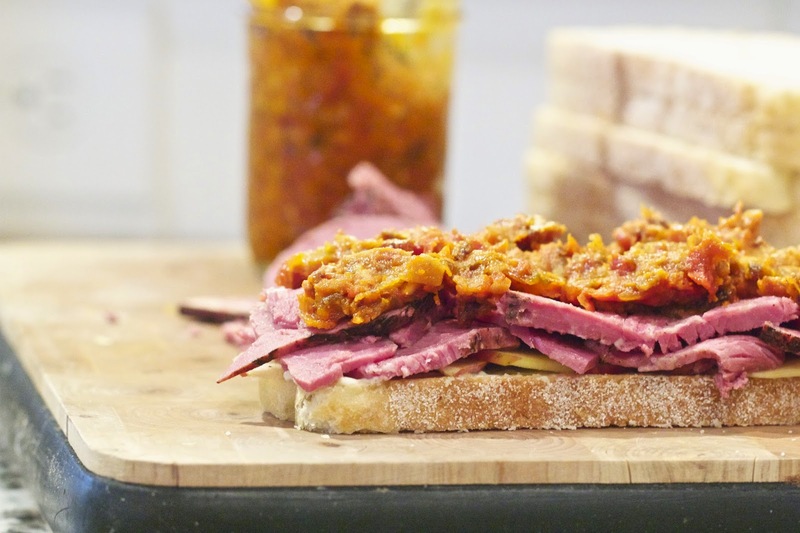 Not a sandwich where you just throw on some deli meat and condiments and call it good, but one where you layer the flavors and combine ingredients and textures to create something that's more than its individual parts. Take this panini here. 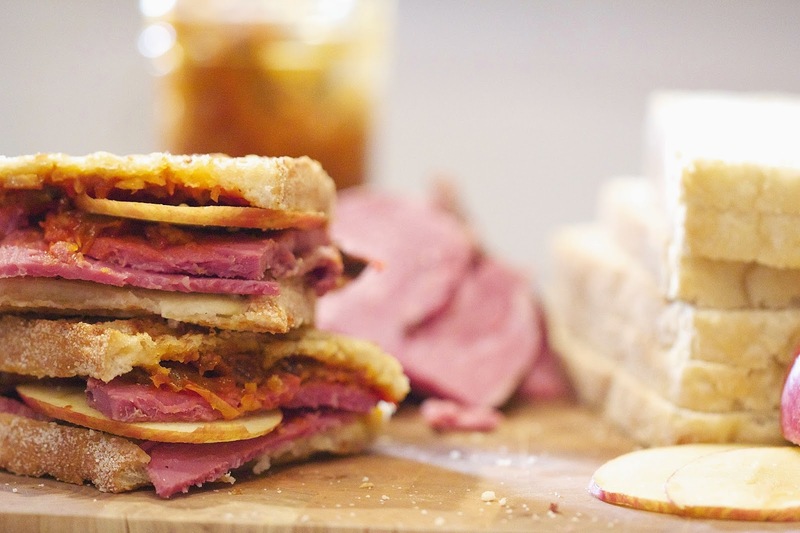 It combines blue cheese, mayo and horseradish to create a complex sauce with the tang of the blue cheese and the bite of horseradish, and then combines it with thin slices of roast beef and crispy apple slices. You'd think you could finish there, and you probably could, but then we add a whole new layer of taste with a smearing of bacon tomato jam before it's toasted on the skillet. And it's honestly the jam that throws it over the top. 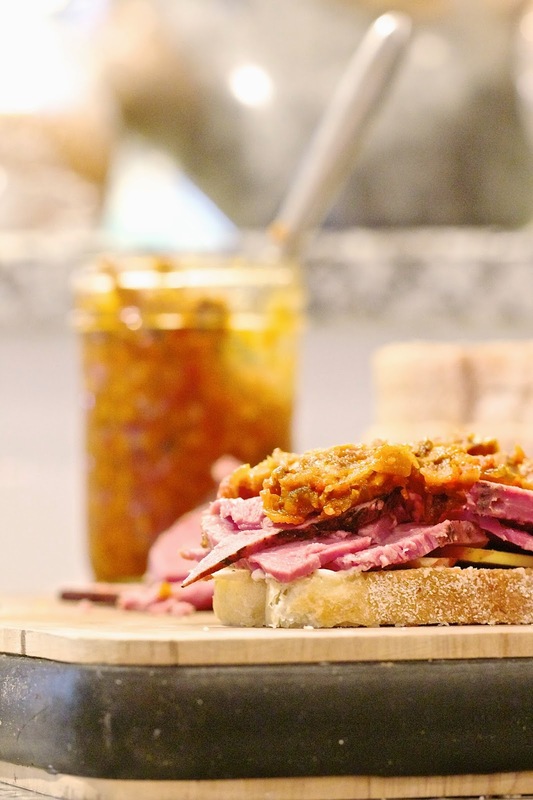 Tomato jam, bacon jam, onion jam, they're all over the place right now and for a good reason. They taste amazing. You slow cook your ingredients with brown sugar and seasonings until they become a thick syrupy concoction that you can put on pretty much anything. The original recipe from the Cast Iron Nation cookbook called for onion jam, but I had a fresh batch of my tomato bacon jam in the fridge so I subbed that in. I'll include the onion jam recipe below, and I'll be sharing my tomato bacon jam recipe soon. The sandwich is grilled on The Lodge Cast Iron Enameled Grill Pan. See how nice that red goes in our kitchen? It's a 10.5 inch pan and it weighs almost a ton. Ok, I don't know the exact weight but it feels so nice to have a small pan that still feels substantial! If you don't have the top panini press, you can use another skillet to press down on your sandwich while cooking to get those deep grill marks. This is also a great pan for grilling your chicken or fish too. The New Cast Iron Nation Cookbook is a definite must for anyone that loves cooking on cast iron as well. It's full of amazing recipes and will utilize every piece of cast iron you have, or want to have! Check out the entry below to win your own copy of the book and a 12 inch skillet! 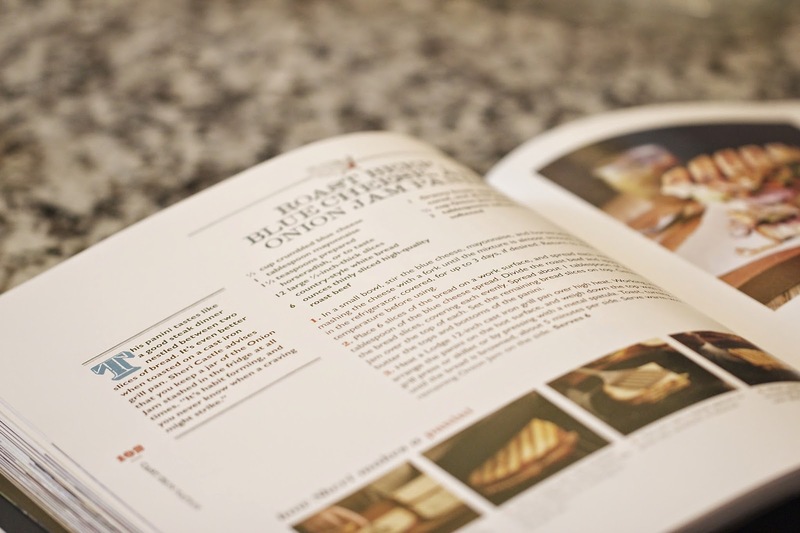 Be sure to check out all the Virtual Potluck Blogs for even more recipes from the cookbook. In a small bowl, stir the blue cheese, mayo and horseradish together, mashing the cheese with a fork until the mixture is almost smooth. Place 6 slices of the bread on a work surface and spread each with 1 heaping tablespoon of the blue cheese spread. 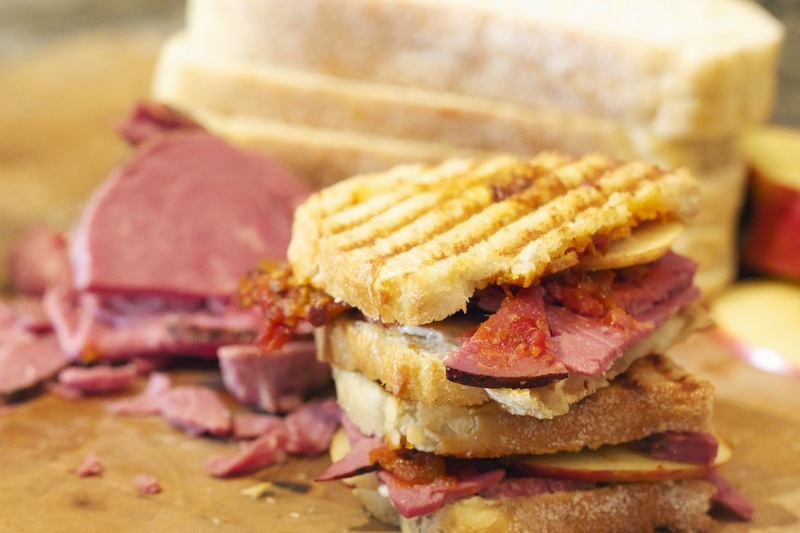 Divide the roast beef and apple among the bread slices, covering each evenly. Spread about 1 tablespoon of the Onion Jam over the top of each. Set the reamining bread slices on top. Generously butter the tops and bottoms of the panini. Heat a Lodge cast iron grill pan over high heat. Working in batches, arrange the panini on the hot surface, and weigh down the top with a cast iron grill press or skillet or by pressing with a metal spatula. Toast, turning once, until the bread is browned, about 5 minutes per side. Serve warm with the remaining Onion Jam on the side. Melt the butter in a Lodge 12 inch cast iron skillet over medium heat. Add the onion, and stir to coat. Cover the skillet and cook, stirring occasionally, until the onions and completely limp, about 15 minutes. Uncover the skillet, and reduce the heat to medium-low.Cook, stirring often to scrape up the brown glaze that forms on the bottom of the skillet, unti lthe onions are very soft and golden brown, about 25 minutes more. Add the brown sugar, wine, and vinegar. Stir until the sugar dissolves and the liquid cooks away, about 5 minutes. Remove from the heat. Stir in the resoemary, and season with salt and pepper to taste. Set aside to cool to room temperature. Store in the refrigerator, covered, for up to 1 week. Disclosure: I was provided the Lodge Cast iron piece for use in this post. 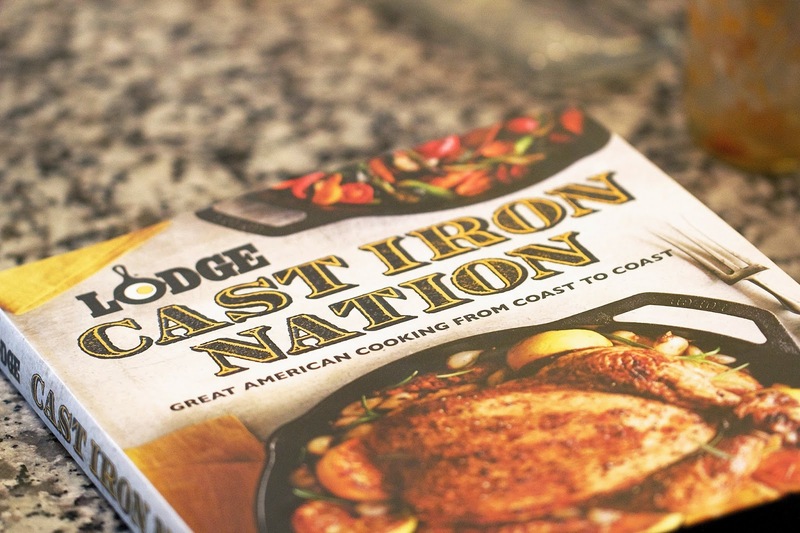 Lodge Cast Iron is the sponsor of the contest. All opionions are my own. Roast beef with blue cheese, horseradish and apple? Yes, please! I have this pan and absolutely love it. This sounds amazing! 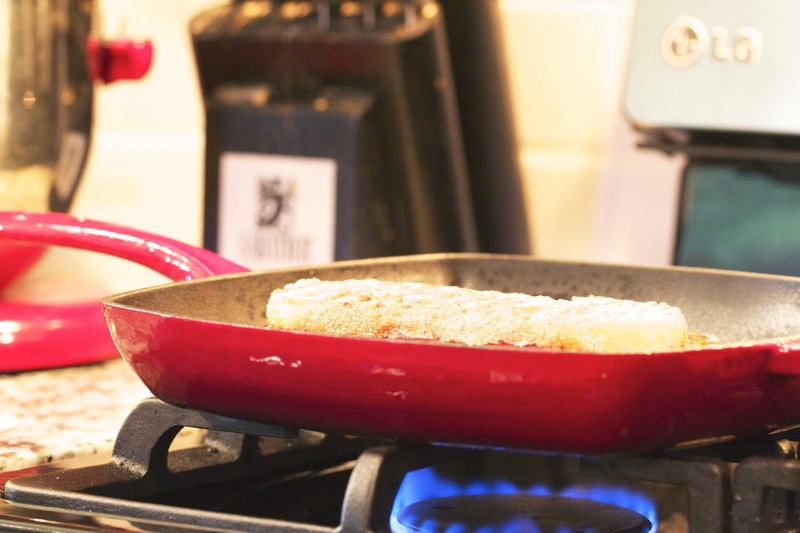 And I love the red cast iron pan!! Looks so delicious and love the enamel cast iron pan! Bet your family enjoyed the sandwich as well! I'm drooling! That's a great looking sandwich. Oh yeah! Love this flavor combination! Gorgeous photos too! I have several Lodge. Love them.